Posted by Steve on July 1, 2013 . 6 comments. Steve, I just wanted to take a minute and thank you for the work you did on _______ on Sunday. By Monday I saw a difference. This evening (Wednesday) I had my horse back. She has not moved this fluidly in 5 years. This is certainly not the first time I’ve heard this story. I remember one owner in particular who called me in to look at a horse with an undiagnosed and absolutely crippling frog infection neither her farrier nor her vet had managed to recognize. That horse’s hooves, along with her other 3 horses’ hooves, were also quite out of balance. And yet, in spite of the realization that her horse was suffering at the hands of her current farrier because of his apparent lack of knowledge, as well as the other problems with his work, she was extremely reluctant to dismiss him. “He’s such a nice guy!” she kept exclaiming. “Niceness” is a wonderful quality, of course, but my horse doesn’t really care a fig about that. He cares about the hoof care provider’s competence, horse-handling abilities, and overall demeanor. Those are the characteristics of any equine professional that ultimately matter to the horse. If my horse’s care providers possess those characteristics, I may (or may not) elect to overlook some of the other things I hear about them, like chronic lateness, unreturned phone calls, unwillingness to answer questions, arrogance, and just plain rudeness. Frankly, I don’t see why I shouldn’t expect to “have it all” from anyone calling himself or herself a professional, but everyone has a different tolerance for what they consider to be “too much.” On the other hand, if I thought for one moment that my horse’s care providers weren’t adequately trained and doing the absolute best possible for him, they’d be gone in half a heartbeat, nice or not! The information presented in them will help you figure out if your hoof care provider, or one under consideration, is actually up to the task from a knowledge perspective. And while I realize they’re written with the barefoot horse in mind, I want to emphasize that everything in them is equally relevant to a horse who wears shoes. That’s because physics is physics, and the laws of nature don’t change just because I might wish they could! So what’s important in trimming a horse to be barefoot is equally important when trimming a horse about to be shod. Once the hoof care provider has cleared the knowledge hurdle, move on to the others. Watch him or her trim a horse or two, and observe how he/she interacts with the animals. Do the horses seem reasonably happy, or can’t wait to get away? Does the handling seem unnecessarily rough? Would you want him or her performing a professional service on you? At that point, the rest is pretty easy; you can decide readily enough whether the people and business skills are adequate, and probably gain some useful insight by talking to some existing customers (which he/she should be happy to have you do). As hard as I know this can be, it’s very important. 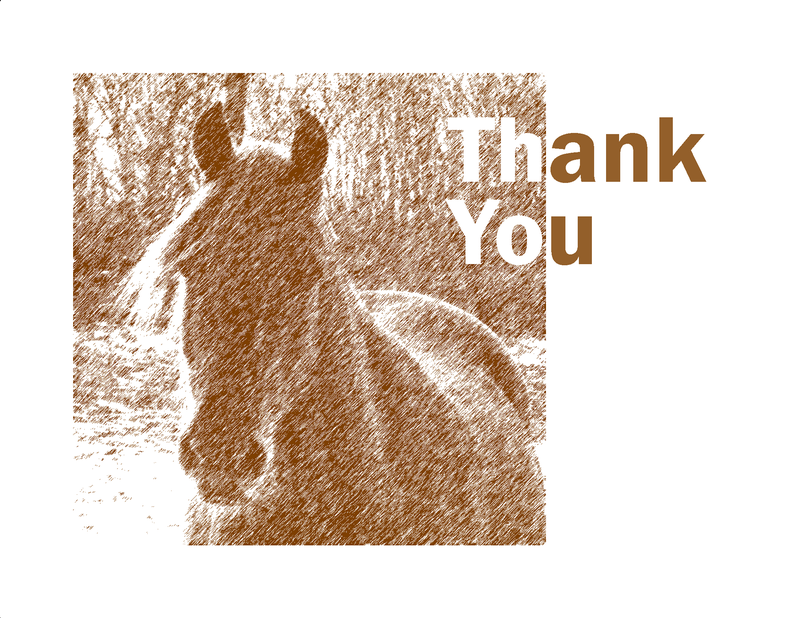 And, ultimately, your horse will thank you for it. 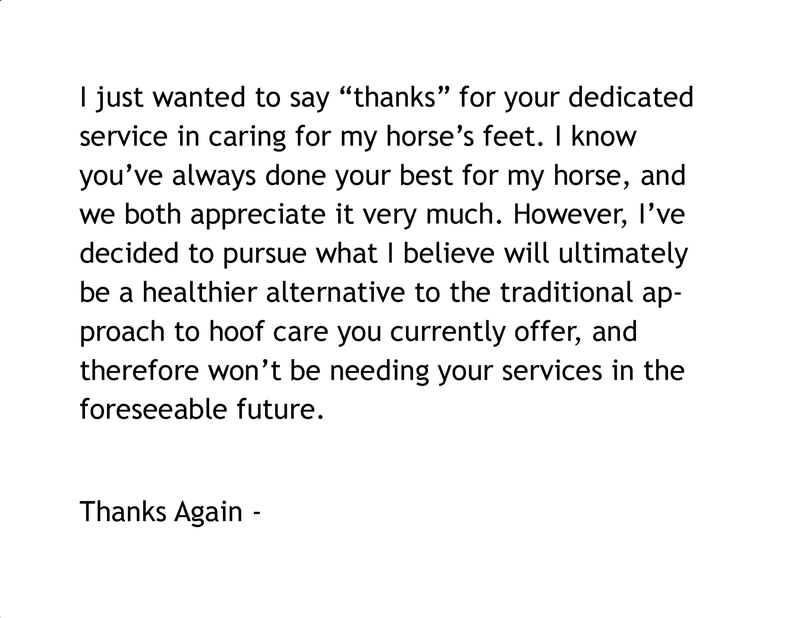 He’ll reward your difficult decision with a happier attitude, better movement, and more years of sound service, which also means more riding time with fewer vet bills. And you’ll reward your decision with less worry, less drama, and a happier attitude about every trip to the barn, which means less overall stress in your life. Life is, indeed, short. You’re worth it. And so is your horse. Share the post "Because Breaking Up is (Apparently) Hard to Do"
Certainly! Contact Nick Hill at CloverRose Equine. Nick is a Certified Practitioner and Field Instructor in our training program. This article hits one of the nails on the head but is not quite the whole story. Getting rid of Mr Nice Guy is indeed almost impossible; one always feels so bad about it. But getting rid of the nasty one is almost as difficult. “He’s a rotten bugger but at least he’s on time…” is an oft heard comment. But surely there are practitioners that aren’t ‘rotten buggers’ who also turn up on time (or whatever other excuse might have been applied). The trouble is, humans love routine and things they are familiar with – even if it is humiliation or abuse. Something new is always scary. One of my clients had a farrier that when he got frustrated, he would kick the horse… Which meant when I turned up on the scene, the horse considered me to be a good target for her kicking practice. Happily, she realised that I was not “one of those” and although the second and third time she had a little go at me, on the fifth visit she actually gave me the offending foot! But why did her owner persist on employing a kicking farrier? Simply because she always had! And in the UK it is no better with the requirement for official registration as a farrier. The BFA is a Masonic type of organisation appointed in the darkness of history by government to be the only body allowed to make up the rules and regulations and actually practice the art of being a blacksmith – strictly a farrier is someone who tends horses, the agricultural equivalent of a groom… The BFA is not a guarantee of quality or knowledge, merely a certificate of membership. The barefoot movement is in general heckled by the BFA for being unprofessional and not having recognised qualifications but the certificates and diplomas handed out by the Jaime Jacksons, Steve Ovniceks et al have no more nor no less value than those handed out by the BFA. Where the BFA does “win” is that it is the British Farriers’ Association and government recognised – this makes people think they must be good! I certainly agree that it can be just as challenging to get rid of the bad ones, because we see some sort of “redeeming” quality that we think overrides the bad one(s). And being the guy who follows the abusive ones can definitely be a bad experience. As I like to say, “horses never forget – they only forgive.” And when they’ve been knocked around, had their legs jerked up and out, their face or mouth torn up, or their feet hurt, they’re usually aren’t too quick to forgive!